The Nina, the Pinta and now found the Santa Maria! A group of underwater explorers say they believe they have located the missing remains of Christopher Columbus’ flagship, the Santa María, more than five centuries after it wrecked in the Caribbean Sea. The Independent reported that the team of explorers said they found the wreck’s remains on the sea’s floor off the north coast of Haiti. “The Haitian government has been extremely helpful — and we now need to continue working with them to carry out a detailed archaeological excavation of the wreck,” he said. Clifford said the shipwreck’s remains were found in the same area where Columbus claimed the Santa María ran aground in December of 1492, four months after it departed from a Spanish port in search for a new route to the East, according to CNN. 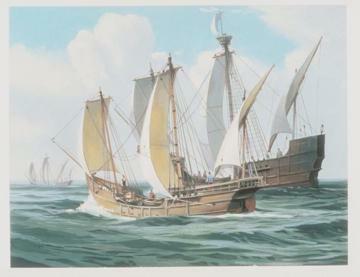 Clifford was led to the site by using information from Christopher Columbus’ diary, according to The Independent. He went back over some photos taken of the site in 2003 before he and his team returned to the location this month to verify the discovery. This is not Clifford’s first major underwater discovery, according to The Washington Post, which reported that Clifford was responsible for finding what may be the only verified pirate shipwreck in 1984. ← It’s 5 o’clock somewhere! !